Start your holiday with a welcome reception at your luxurious seafront hotel in Monte Carlo. 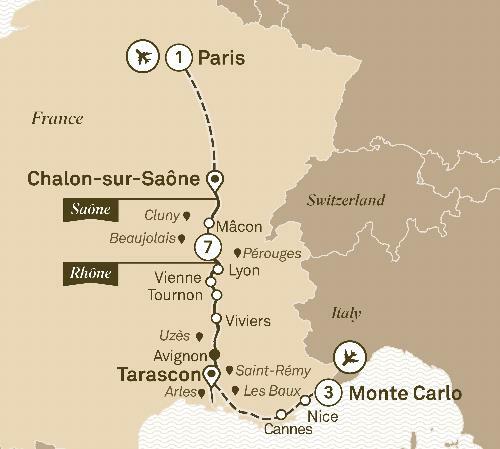 Over 12 days, journey from Nice to Paris in 5-star luxury. Visit Monte Carlo and cruise the Rhône towards Chalon-sur-Saône. End with a night in Paris. Begin your journey in Monte Carlo for a three night stay before boardin your luxurious Scenic Space-Ship in the old Roman town of Tarascon for your cruise along the Rhône and Saône rivers over eight glorious days. With its picturesque villages, and beautiful towns, you’ll drift through a land of resplendent castles and awe-inspiring cathedrals before arriving in Paris, the 'city of light'.